Home > January 2019 > See Intrepid during Must-See Week! See Intrepid during Must-See Week! 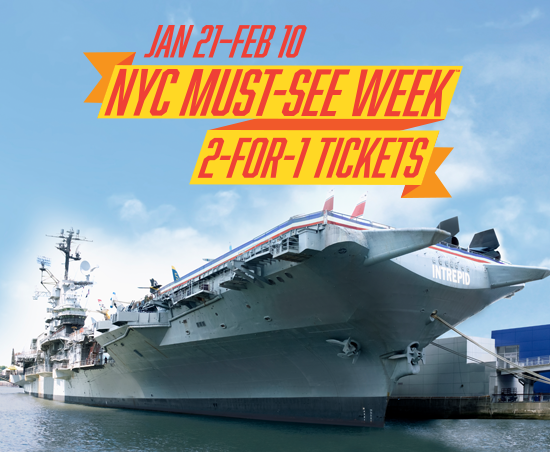 The Intrepid is once again taking part in NYC Must-See Week℠! From January 21 to February 10, enjoy 2-for-1 tickets to the Museum. Bring a friend for free, or treat the whole family for half the price. There’s no better time to explore the ship, see the space shuttle and check out our new mixed-reality experiences in the Space Shuttle Pavilion! Use promo code MUSTSEE19 at checkout.